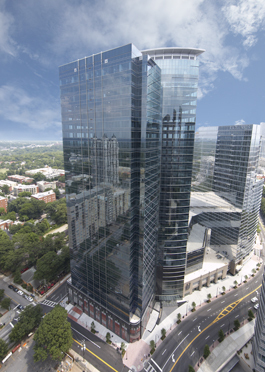 RJTR was responsible for urban planning, architecture, interior design, structural and MEP design services, signage design, retail lease exhibits, and office tenant test fit services for the 1075 Peachtree Street office building, a 38-story, Class A office building consisting of approximately 753,000 sf. The property also includes 60,000 sf of street-level retail, the 414-room Loews Atlanta Hotel and 52 luxury apartments atop the hotel. Tenants and visitors of 1075 enjoy secure parking in an impressive 700,000 sf, 12-story parking structure which accommodates 1,726 cars. 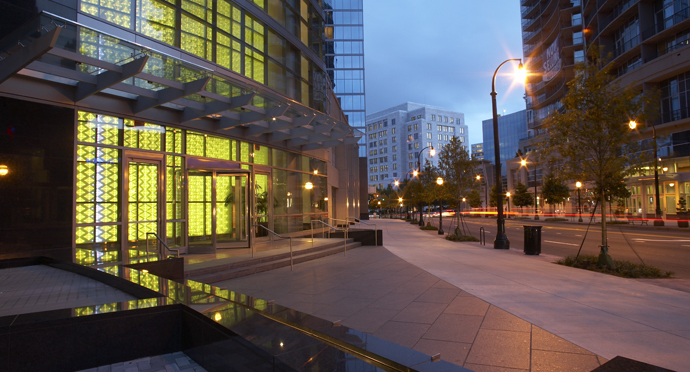 1075 is located in the business district of Midtown Atlanta on Peachtree Street, Atlanta’s most widely recognized and most traveled thoroughfare. Construction completed in 2010 at a total cost of approximately $500 million for the multi-use complex.